Barkisland retained top spot in the Huddersfield League’s Championship with a 16-run win away to Calderdale rivals Rastrick in a 30 overs per side contest yesterday. The visitors looked vulnerable when they only managed 134-9, overseas ace Asif Afridi taking 5-14 off nine overs. Luke Bridges weathered the storm and went on to make 46 not out as his side recovered from 59-6. Matthew Steers (20) helped add valuable runs at the end. Aussie Sam Moyle, Bridges and skipper Darren Robinson each took three wickets as the Round Hill men were all out for 118 in reply. Elland completed a good few days with a 42-run win over struggling Meltham, who were all out for 107 in reply to the Hullen Edge men’s 149-7. Greg Alexander made 55 and Jacob Bower 36 before spinner Peter Dobson took four wickets and Alec Hodgson three. Elland had won their T20 quarter-final against Clayton West on Thursday, scoring 180-7 with 66 from Hodgson and then restricting their opponents to 160-9 with four wickets from Jack Hendy and three from Jacob Bower. Walsden’s hopes of become Lancashire League champions at the first time of asking are starting to soar after they powered into a 16-point lead at the top. Another superb innings from Joe Gale helped them to a 168-run win at Colne while nearest pursuers Ramsbottom and Darwen were beaten. The Scott Street men, who had lost to holders Clitheroe in the T20 quarter-finals on Friday, made it 12 straight league wins in 2018 after Gale had hit 119 not out from only 58 balls. Sri Lankan Umesh Karunaratne (86 no), a free-scoring batsman himself, was consigned to almost a support role as he and the younger Gale brother added 221 to lift the Walsden total to 330-4. Earlier, Josh Gale had passed 500 runs for the season with 55. Colne were dismissed for 162 in reply with Stevie Barker (4-28) and Martin Harlow (3-37) among the wickets as Kenton Rhodes and Chris Walton both hit 40. Todmorden warmed up for today’s Worsley Cup semi-final at home to Burnley with an excellent five-wicket win over Darwen at Centre Vale. Faisal Rasool had an excellent first half to the contest and Bilal Abbas was their star man in the second half. Rasool came up trumps in an injury-hit Todmorden bowling line-up, taking 5-26 to help dismiss Darwen for 163. Tod’s target would have been fewer but for a last wicket stand of 48 between John Cordingley (22) and Scott Jackson (27 no). The loss of sub professional Qaiser Abbas left Tod 49-3 brought Abbas to the wicket and made 70 not out to seal victory, sharing stands of 84 with skipper Andrew Sutcliffe (37) and 29 with brother Kai (15 no), who finished the game in the 32nd over with a six. Lightcliffe and Northowram Fields were beaten in games with breakfast-time starts in the Bradford League but Brighouse notched another win to stay on the fringes of the promotion range. Matt Baxter’s Lightcliffe made another low total away to Pudsey St Lawrence but this time they had an excuse, a pitch of inconsistent bounce making it tough for both batting line-ups. The visitors were all out for 80 in 24.1 overs with the 28 extras by far the biggest contributor and only Mark Gill (17) and Josh Wheatley (10) in double figures. Richie Lamb (6-27) and Charlie Parker (4-36) were the bowlers to benefit. Saints, who are among the title contenders, were made to struggle to complete a three-wicket win. The game was in the balance when they slipped to 45-6 before Parker’s 19 not out settled matters, Yassir Abbas (4-38) and Suleman Khan (3-35) giving the title hopefuls plenty to think about. Northowram made the short journey on towards Odsal top and posted 211 all out against Buttershaw St Paul’s, AJ Weerappuli top-scoring for the second successive Saturday with 46. Zafar Khan left St Paul’s 3-2 but Northowram had a long wait for a further success. Paul Carroll had a couple of lives in a knock of 112, adding 197 for the third wicket with opener Jonathan Burston (72no) as Buttershaw won by seven wickets. 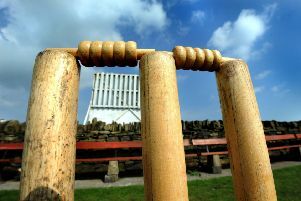 Brighouse surged to an eight-wicket win over Hopton Mills, who were 83-2 before Mohammed Abdul-Wahab came on to bowl and took 6-33 to polish off the Mirfield side for 136. Overseas player Deron Greaves (56no) and Sohail Hussain (38no) helped Brighouse complete victory in 22 overs.